← ANDREW FARRAN. Parliamentary inquiry on proposal for a Bipartisan Defence Agreement to govern future procurements. TRISTAN EDIS. How renewables trumped brown coal and gas over Australia’s summer. In reading some of the panic-stricken media commentary about the impending blackouts we were supposed to have this summer, you might have been led to believe that renewable energy doesn’t contribute much at all to ensuring the lights stayed on. If it ain’t baseload then it isn’t any good, some people want you to believe. The implication is that we therefore can’t reduce Australia’s carbon emissions unless we’re prepared to accept regular blackouts, or nuclear power. Unfortunately, it seems our political debate about how we ensure reliable supplies of electricity has been boiled down to some simplistic yes-no question about whether it is “base-load”. We may even have a policy imposed upon our energy market that will separate powers sources into one of two categories – dispatchable or not dispatchable. If you’re dispatchable then you contribute to a “reliability guarantee”, otherwise you’re out. But typically the world is a bit more complicated than something that can be boiled down to a simple yes-no question. 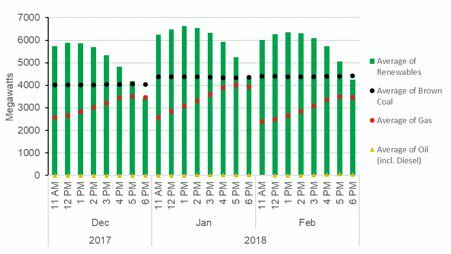 While this may come as a surprise to some politicians and media commentators, electricity demand is not constant across all times of the day. Most of the time we’ve got more than enough electricity generating capacity to go around, particularly at night time. The times when demand can get so high as to stretch our available supplies tend to be when businesses are operating and we’re up and about and it’s particularly hot. That co-incidently happens to be when the sun is out and at intense levels. Also it is true that the amount of wind does vary quite a lot – does this mean this source of energy is next to useless? Green Energy Markets in our recent February edition of the Renewable Energy Index thought it worthwhile to review how much power we received from renewable energy over summer to see whether it was as useless as some political and media commentators might suggest. 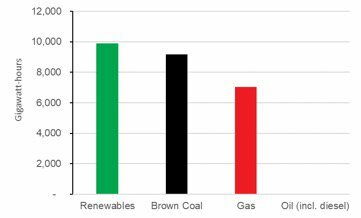 No surprises that black coal was by far the most dominant source of electricity over summer, just as it is across the rest of the year. However, the second largest source of electricity across the main grids of the NEM and South-West Interconnected System was zero emission renewables with 9,880GWh. It was 8% greater than brown coal and 40% more than gas. In case you were wondering, power from oil-based fuels such as diesel were negligible, contrary to suggestions from our energy minister Josh Frydenberg that we had to resort to some huge amounts of pollutant spewing diesel generators to keep the lights on. But this actually undersells the importance of renewable energy to reliability, because our study shows it delivered most of its electricity during the periods when demand for power was highest. Over the last summer in the NEM, electricity demand was at its highest over the period of 10:30AM to 6:30PM. After 6:30PM power demand was almost always lower than the half hour of 10:30AM-11AM, and it certainly was lower on the days when we had the highest electricity demand. The chart below details the average amount of power received during each of the hours in the 10:30AM-6:30PM period across the months of December, January and February by fuel type. Please note that the way I’ve labelled the charts is such that 11am in the chart below and in subsequent charts denotes an average of the power supplied between 10:30am and 11:30am and likewise 6pm denotes the average of power across 5:30PM to 6:30PM. The sceptics amongst you might justifiably say, “sure that might be the averages but they can smooth over the sins within the sample of renewable energy’s intermittency”. So let’s instead look at the specific 40 individual half hour periods over summer that represent the highest system-wide demand, instead. These actually show renewable energy producing more power than what we see in the averages, which is partly a function of the fact that system demand reaches its highest point when the sun is beating down. It is important to acknowledge that hydro (a dispatchable technology) does play an important part in these figures. To understand its role relative to wind and solar (unfortunately AEMO doesn’t meter most of the bioenergy plants) let’s delve down into the three highest demand days over summer, looking at the half hour periods of time when demand exceeded 32,000MW. The chart below represents the period when NEM system demand reached its highest point over summer which was 19 December. Demand went over 32,000MW in the period ending 11:30AM and subsided below that level after 5PM. Wind output was quite solid at that time, with wind farms producing about 55% to 60% of their rated capacity across the entire period. 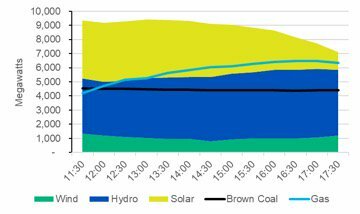 Solar PV produced above 3000MW until 2:30, and as it dropped around 3pm hydro generation lifted. The next highest demand day was on 19 January when demand was above 32,000MW from 11AM until 5:30PM. Wind output wasn’t nearly as high on that day at between 802MW to 1,344MW or 16% to 28% of the installed capacity. Is that useless? Well it was about 97% of the output produced by Liddell Power Station over the same time period. Solar meanwhile had a very good day – punching out an average of just over 4,000MW to 2:30PM. Again, as it dropped away in the afternoon, hydro output came up, and produced an average of 4,756MW from 2:30PM to 5PM. 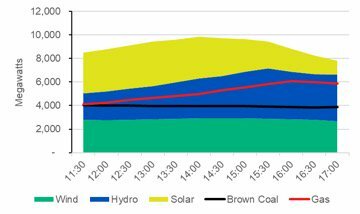 Renewable generation by fuel compared to gas and brown coal by 30 minute interval on the second highest NEM demand period last summer (19 Jan). On the third highest demand day –22 January – wind output began at 1,057MW as demand clocked over 32,000MW in the 30 minute period preceding 1PM (13:00). It then steadily rose to 1,446MW before demand subsided below 32,000MW after 5PM. 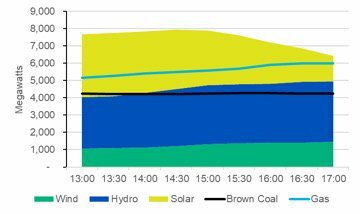 Solar output was substantial but not as high as 19 January – providing 3,642MW in the period ending 1PM and remaining above 3000MW until 3PM. Hydro again lifted in the afternoon, and provided an average of almost 3,300MW across the period that demand was above 32,000MW. 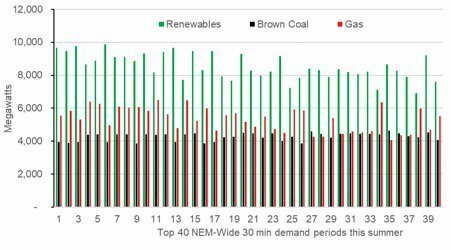 Renewable generation by fuel compared to gas and brown coal by 30 minute interval on the third highest NEM demand period last summer (19 Jan). So what are the implications of this analysis? Clearly renewables are making an important contribution to meeting peak demand and therefore addressing reliability. Yes, it is indisputable that the ability to control the dispatch of hydro plant independent of short-term weather events is vitally important – particularly to meeting demand peaks in the late afternoon and early evening. But solar output’s high correlation with weather events that drive peaks in demand makes it also very valuable. Wind output isn’t nearly as well aligned with peaks in demand, but it is hardly useless. The chart below details the proportion of wind installed capacity that was generating during the top 50 half hour demand intervals over last summer. For 45 of these 50 intervals wind produced 18% or more of its rated capacity, for half of the intervals it was greater than 41%. Suggestions wind power doesn’t make any useful contribution to meeting peak demand seem to ignore this. Proportion of NEM wind power’s installed capacity generating electricity during the top 50 half hour demand intervals over last summer. In considering the design of the National Energy Guarantee it’s important to note that there is more to ensuring reliability than a simplistic evaluation of whether or not a power generator has dispatchable capacity. The current energy-only market design for the NEM provides a vastly more sophisticated set of incentives for delivering capacity when its required than a central planner can manage. Critically, the incentives are dynamic, responding every five minutes to changes in the supply-demand balance. There are an incredible array of options available to us to reduce electricity emissions while also ensuring reliable electricity supplies. This will require a sophisticated mixing and matching of different technologies and balancing of statistical probabilities. Controllable dispatchable capacity will clearly be important in balancing out the variability of wind and solar. But at the same time the geographical spacing of wind and solar will also help, as will greater transmission interconnection. We may also see consumers shift their demand into the midday period to take advantage of high solar output at this time. Further gains in low wind speed turbine technology may also result in less variability in wind farms’ output. Such a complex array of decisions are best left to market participants, not Barnaby Joyce or Craig Kelly, not Malcolm Turnbull or Bill Shorten, and not even AEMO head Audrey Zibelman. One Response to TRISTAN EDIS. How renewables trumped brown coal and gas over Australia’s summer. Great article – made even better with great graphs!